How Did You Find Out About Osama bin Laden’s Death? Well, I was watching Celebrity Apprentice (I know, I know, it’s bad. But I like watching them complete the tasks and then fight it out afterwards. Get over it!) on delay by about 15 minutes when I saw the message pop-up that the President would soon be addressing the country. I wasn’t really sure what it was. Were we attacked? Did we attack someone? Was the economy cured? So, instead of stopping the DVR and jumping to live TV I grabbed my phone to check Twitter. Scrolling through the previous 60 minutes of Tweets I finally arrived at the tweets saying that Osama bin Laden had been killed. I then stopped the DVR and turned to live TV to the news coverage discussing what they had been told, the events that transpired years ago leading up to this, as well as speculation about what had happened. I then continued to check Twitter and update my status while I waited the hour before President Obama came on and made the speech. I’m glad I waited. Even though I knew what he was going to be talking about, it made it all real and he was able to put things into perspective. But enough about that, why I’m writing the post. I was reading a CNN article titled Bin Laden’s death sets Twitter record and when I got to the end, I read a lot of stories that were similar to mine. There has been a lot of news coverage about how people are getting more and more of their news from the Internet and Twitter, but it’s interesting that when a breaking news story hit, people turned to the TVs. Part of this might be explained by the fact that it was a Sunday evening and most Americans were probably at home where many of them have a television. I know when I’m at work (or as on 9/11 at school) I didn’t have access to a television where I could find the news. What are your thoughts? Where did you first hear/see that Osama had been killed? What did you do next? 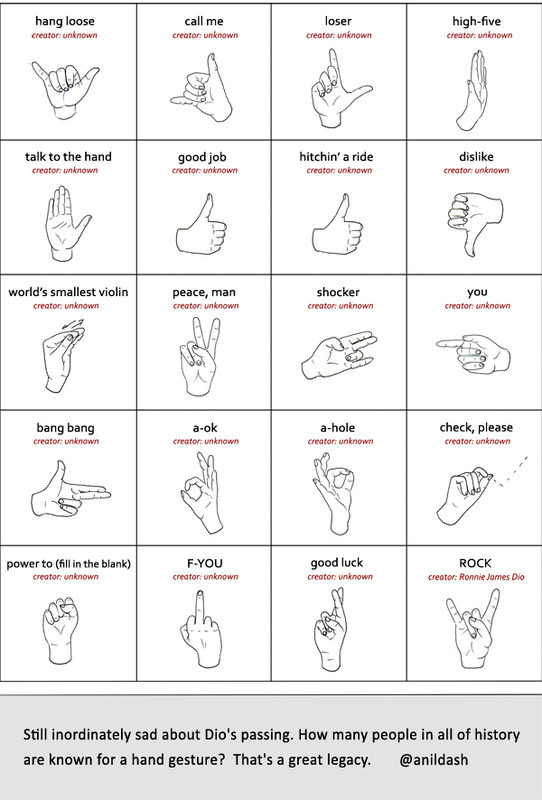 Over on YouFail they’ve illustrated some of the many hand signals in our culture. 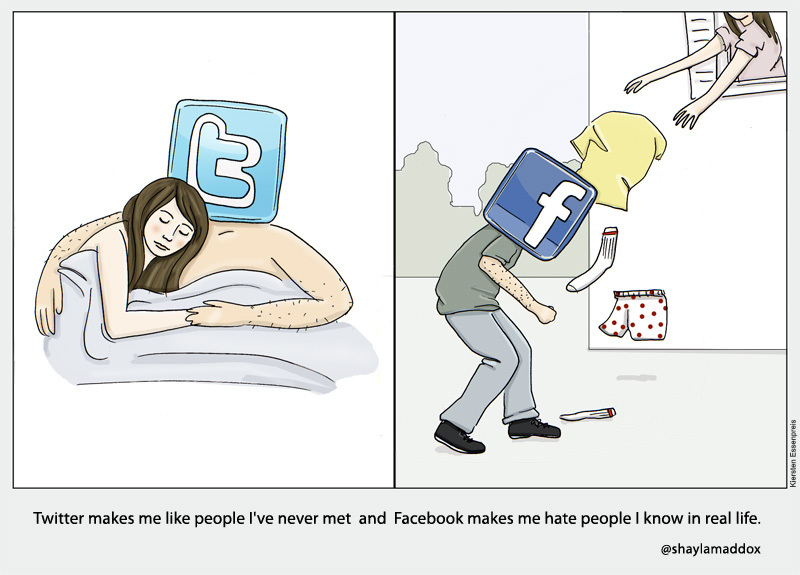 When asked about the difference between Twitter and Facebook, I usually reply “Facebook is for the people you knew in high school, and Twitter is for the people you wish you knew in high school.” Well, @shaylamaddox had a slightly different way of putting that, which was then turned into an illustration by Kiersten (although I can’t find the link to the original, she has some cool stuff on her blog). Imagine my bewilderment when I read that she had free time. I decided to share this bewilderment and amazement with her and the rest of the Twitterverse. This is why I love Twitter. Because Inigo Montoya can call me out! I don’t personally know him, so had I posted the previous comment on Facebook, he never would have been able to call me out on it. Welp, thanks for the reality check @iaminigomontoya and the enjoyable start to my Friday morning! Social Media is the buzz these days, everyone’s got to be in it from your Grandma to your pizzeria. Sarah Chong over at Penn Olsen has compiled 10 Social Media Inforgraphics spanning across many different sites. 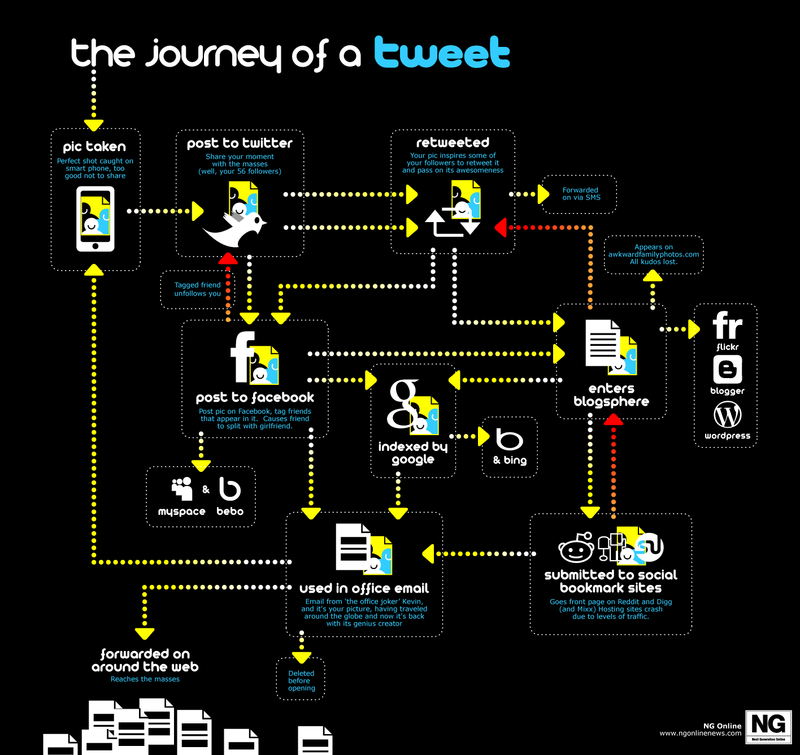 I enjoyed the “Journey of a Tweet” (shown below) and also liked “Chicks Rule“, with the exception of Digg.